Dissemination and education of local natural resource issues is an ongoing priority for Natural Resource Management (NRM) and Environmental Agencies. However, with an ever-increasing amount of information competing for our time and attention, getting the message across is increasingly difficult. This project is an investigation of whether new emerging technology, such as touch tables, can help adults gain a better understanding of the nature of natural resource issues. The hypothesis investigated was that a tangible multi-touch table interface encouraged understanding of natural resource issues using map-based constructivist learning tasks. The natural resource issue of Preparing for bushfire was chosen to test this hypothesis. It addressed key problems such as the low inclination by residents to prepare for bushfire. The system design and content evolved from participatory involvement of three bushfire community groups. The table interface displayed local real world map information including online aerial photographs, property boundaries, building locations, elevation, fire history, and building defensive zones. The table interface system was designed for adults to complete short map-based interactive bushfire problem solving tasks using purpose-designed model objects: such as a house, chainsaw and a rake. The models worked seamlessly on the touch table providing immediate real-time feedback. The rake and chainsaw models operated similarly to their real-world counterparts. The chainsaw operated with short cutting movements, while the rake operated with sweeping motions, which allowed adults to physically play with scenarios in order to view the effects of real world natural resource interactions. The tangible table interface system was compared with the closest existing traditionally equivalent method using a within subjects exercise of 64 adult participants from the general public in situ at the local library and museum. After using the Preparing for bushfire table interface all of the participants improved upon their pre-test scores indicating they learnt from the experience (F(1)=13.01,p<0.001). Comparative evaluation showed that the participants had a significantly greater learning gain from using the tangible table than the traditional method (F(1)=13.01,p<0.001). Furthermore, follow-up questions showed that 100% of participants believed they learnt about Preparing for bushfire by using the table interface, and 70% felt motivated to undertake preparations for bushfire. The original contribution to knowledge includes design rules for adult user preferences of topic choice, constructivist task design, interface object design, and object to surface operational functionality. These design rules were the guidelines behind the interface design that validated the hypothesis. Adult members of the general public improved their understanding of preparing for bushfire (the selected natural resource issue) by using a purpose designed tangible multi-touch table with custom physical models for constructivist learning tasks (p<0.001). 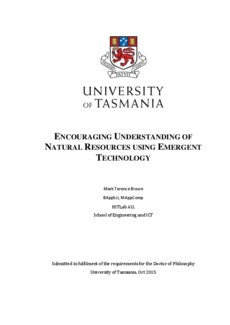 Further research should attempt to apply this method to expand the key messages presented for Preparing for bushfire, or evaluate this method for other natural resource issues.